Practice makes perfect with this Callaway 9-pk. 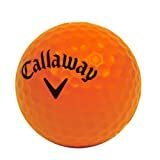 HX Practice Golf Balls. Soft foam construction won't damage clubs or property. Hex pattern simulates true ball flight. Includes mesh bag for easy storage.